Richard R. “Slim” Critchlow was born in Pennsylvania circa 1909. When he was still a child, his family moved to Iowa, then Utah for a few years, then to Oklahoma where Slim became knowledgeable about cowboys and horses. In 1923, his father took the family to California where Slim finished high school. He then moved back to Utah and spent time in Idaho as well, eventually settling in Salt Lake City. In 1929 he began working seasonally as a park ranger at Zion and Bryce Canyon National Parks in Utah, also as a game warden. During this period, he enjoyed riding and roping and participating in local rodeos. In 1930, Critchlow heard a singing group on the radio so he approached them with his repertoire of oldtime cowboy songs and got hired to perform on a midnight program. He then formed another group, the Utah Buckaroos, and began broadcasting over station KSL. 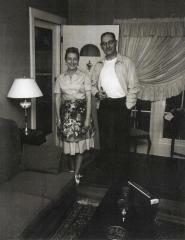 In 1936, Slim and his wife, Ef, moved to California where he was eventually “discovered” by members of the Berkeley area folk music revival in the late 1950s, most notably Barry Olivier, who was impressed by Critchlow’s preference for an authentic style of singing cowboy songs (compared to those encountered in Hollywood movies) as he had heard them in the 1920s. With encouragement from admirers like Olivier, Critchlow began performing at festivals and other folk music events in the Bay area. Throughout the 1960s, Olivier devoted time to recording Slim Critchlow’s cowboy and trail songs and later produced an LP for the Arhoolie label called “The Crooked Trail to Holbrook.” Slim Critchlow passed away October 31, 1969 a few months before the record was released. In 1999, Arhoolie re-released the LP as a compact disc with added previously unreleased material. Olivier donated his original recordings to the Western Folklife Center Archives in 2002 along with digital copies and other documentation relating to Slim Critchlow’s music, including photocopied 1940s correspondence (supplied by Critchlow’s son, David) with cowboy song scholars John A. Lomax, John I. White, Katie Lee, and Austin Fife. The collection includes 26 open reel tapes; 16 cassette tapes containing various content including dubs of the reels plus a commercial release produced by David Critchlow entitled “The Driftin’ Cowboy;” 2 copies of the Arhoolie CD release; several CD-R compilations containing digital material derived from the analog tape originals; a few photographs; correspondence; documentation of recording sessions and contemplated products; and photocopies of clippings about Critchlow’s careeer and funeral notices from newspapers. —Gift of Barry Olivier, 2002. Barry Olivier / Slim Critchlow Cowboy Songs Collection. Western Folklife Center.